Nikki Haley firmly condemned Russia after its military forces captured three Ukrainian naval vessels off the coast of Crimea. The U.S. ambassador to the United Nations made the remarks during an emergency meeting of the U.N. Security Council on Monday. "This is no way for a law-abiding, civilized nation to act. Impeding Ukraine's lawful transit through the Kerch Strait is a violation under international law. It is an arrogant act that the international community must condemn and will never accept," Haley said. "The United States will continue to stand with the people of Ukraine against the Russian aggression," she added later. Haley called on Russia to quit its "outlaw actions" if it hopes to cultivate a better relationship with the United States. "We call on Russia to respect its international obligations and not obstruct or harass Ukraine's transit in the Kerch Strait and to deescalate the tensions it has created. As President Trump said many times, the United States would welcome a normal relationship with Russia, but outlaw actions like this one continue to make that impossible," she said. 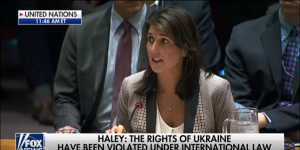 "In the name of international peace and security, Russia must immediately cease its unlawful conduct and respect the navigational rights and freedoms of all states," Haley concluded. On Sunday, Russia captured three Ukrainian naval ships and 23 crew members off the coast of Crimea, which Russia annexed in 2014. Ukraine called it an "act of aggression," while Russia claimed the captured vessels had illegally entered its waters, waters it had temporarily closed for shipping. Ukraine claimed Russia violated international law on the grounds that Crimea belongs to it, and also because a 2003 treaty between Russia and Ukraine upholds unimpeded access to the Kerch Strait.